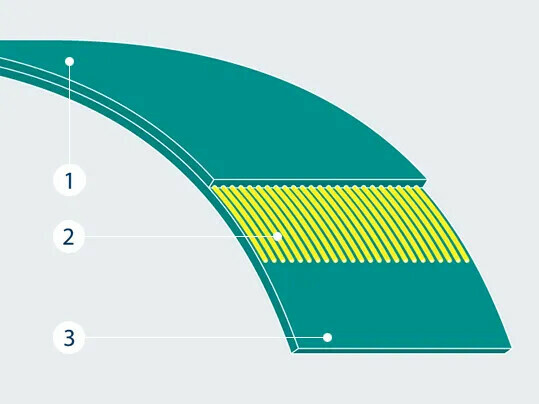 Extremultus flat belts from the aramide line are available to suit applications with two different types of tension members. 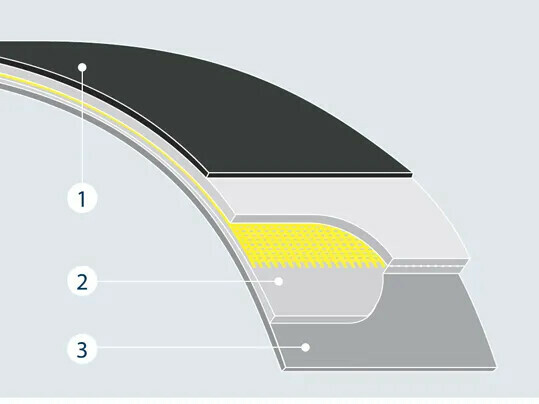 Flat belts with a tension member made of a blended fabric with aramide warp are designed for high levels of specific effective pull and extremely short take-up ranges. The aramide line needs to be handled carefully because aramide fibers should not be bent. Because they are very strong, flat belts with truly endless aramide cord tension members can transmit very high levels of pull at very low elongation. As a result, they only need very short take-up ranges and are not sensitive to fluctuations in ambient conditions. Because they are very flexible and track very steadily and evenly, they are an excellent choice where high levels of power transmission and multiple rotations are required. * Material based standard range. Depending on the application, different ranges could be recommended.